Owning one of the best espresso machines means you can get your caffeine fix quickly. When you own a home espresso machine, there’s no need to wait in a long line at your favorite coffee shop again. Espresso, like the name suggests, is quick to brew when you have your own espresso maker. There are many espresso makers and coffee machines on the market, so it can be difficult to find what is best for you. Sometimes sorting through all the espresso machine reviews can get overwhelming when you find to find the best espresso machines available. To make choosing an espresso machine easier, we reviewed the best semi-automatic espresso machine, the best automatic espresso machine, the best manual espresso machine, the best dual coffee and espresso machine and the best espresso machine you can buy for under $200. After our espresso machine reviews, keep reading to see our buying guide. Whether you prefer to have your espresso made automatically or you like to pull your own espresso, read our espresso machine reviews to find your perfect fit. Ninja Coffee delivers an awesome dual coffee and espresso machine for under $200. 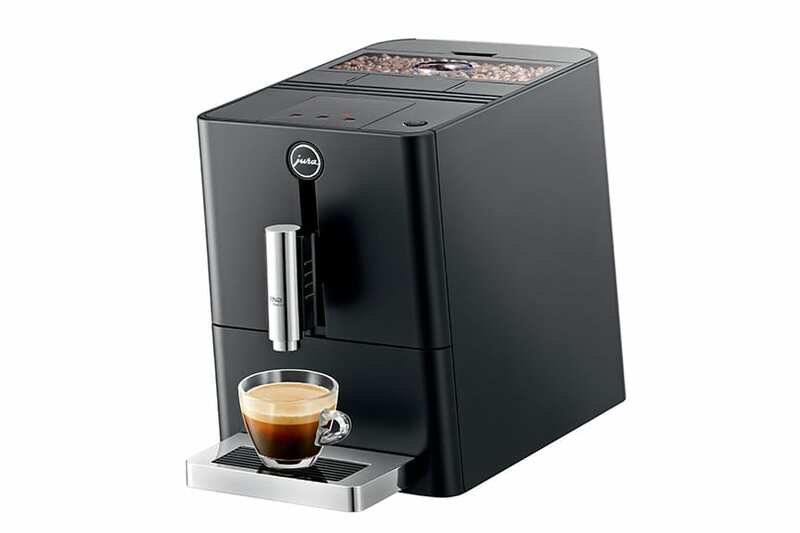 Multifunctional machines like this one are perfect for the coffee lover who wants unlimited brewing capabilities. This amazing machine is capable of brewing a ten-pot cup of regular coffee, a single cup of regular coffee and a variety of espresso drinks with just the touch of a button. 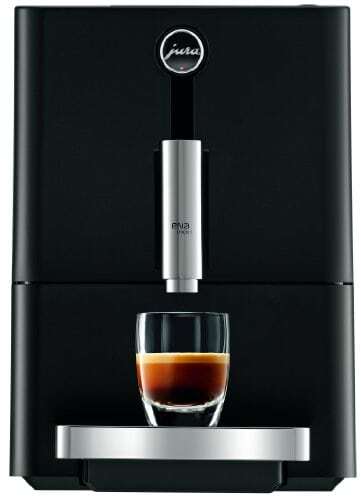 You can even brew your coffee or espresso over ice! Your purchase also comes with a recipe inspiration guide. 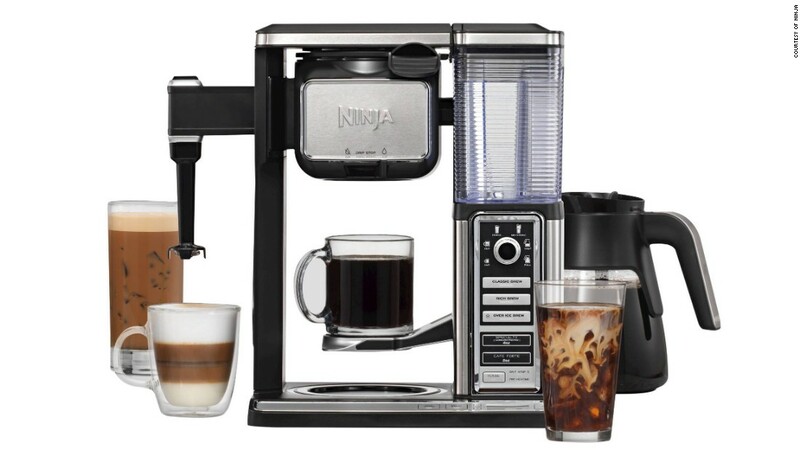 With the Ninja Coffee Bar Glass Carafe System, your coffee and espresso drink options are endless. Affordable: The capability that this home espresso machine and coffee machine offers is incredible for the price. Built-in milk frother: In the mood for an iced cappuccino? The built-in steam wand can steam your milk both hot or cold. Coffee and espresso options: We believe that this is the best coffee machine and espresso maker all in one. Drip-stop function: This helpful feature helps eliminate messes. 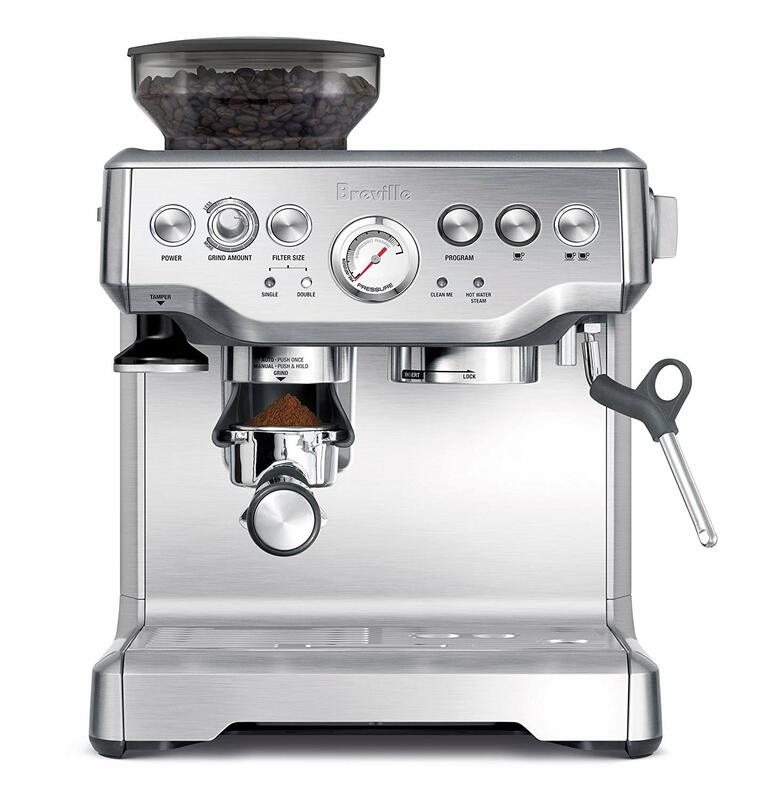 Easy-to-use: The dial controls and push buttons make it easy to control your brew. High-quality materials: This espresso maker both looks and feels high-quality because of the good materials it is made from. Bulky: This home coffee machine needs a lot of counter space or storage space for all the parts. It’s one of the larger models available and weighs almost 10 lbs. No built-in grinder: Unlike some of the other best espresso machines on the market, this one doesn’t grind the beans for you. No self-cleaning functions: You’ll have to clean all the parts one at a time. This attractive home espresso machine is the best semi-automatic machine you can buy. It’s modern looking design isn’t just for show either. It has both automatic and manual machine capabilities. If you’re a coffee aficionado, this is the best espresso machine for you. 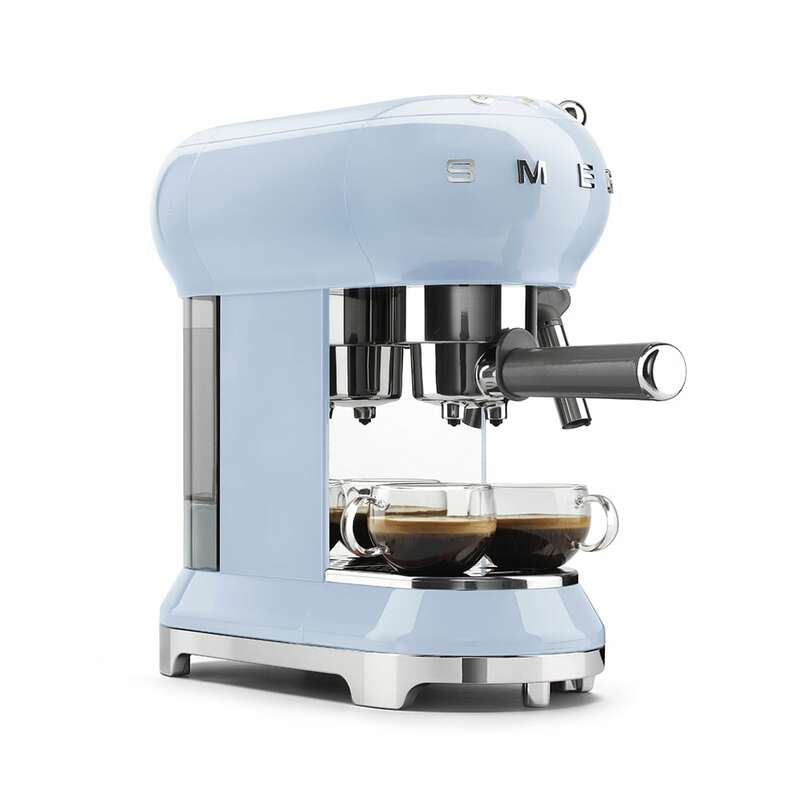 This sleek espresso machine gives you the most control over the flavor and the strength of your espresso shot. This machine gives you access to a lot of settings. You can brew either a single or a double shot of espresso and froth the perfect foam with the built-in steam wand attached at the side. This espresso maker weighs in at 27 lbs! It’s a hefty machine with an even heftier price tag. But with the Breville Barista Express, you’ll be able to brew cafe-quality espresso drinks from the comfort of your own home. With the right warranty, this machine will last a lifetime. Adjustable temperature and grind size settings: This espresso maker comes with a built-in coffee grinder with settings that allow you to adjust the size of the grind with just the touch of a button. You can also easily control the temperature. Expert control over grind and pull: You can easily adjust the grind size and pull time to get your espresso just the way that you like it. Semi-automatic and automatic capabilities: If you like having the choice on how you prepare your espresso, this machine will give it to you. Removable tampers and filters: This makes them easier to clean and help you get your ideal espresso. Removable water tank with handle: This tank is to-filled and has a water filter so you won’t have to worry about build-up or impurities. Thermo-coiling heater system: This helps accurately control the water temperature. 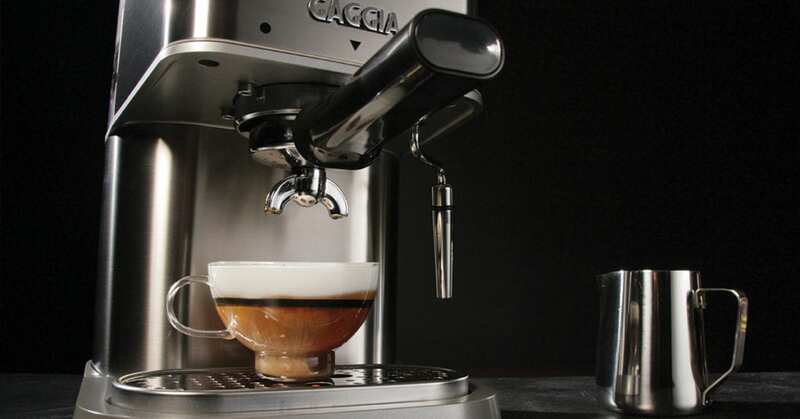 High price tag: You’ll be paying a lot for a home espresso machine if you choose this machine. Needs to be cleaned often: This machine needs to be cleaned frequently. However, the hidden storage compartment for cleaning tools helps make this easier, and you can use our guide on how to clean an espresso machine to help. Looking for an espresso machine that will brew the perfect espresso shot with just the touch of a button? The Jura Ena Micro 1 is great for novice espresso makers who are looking for a good caffeine fix. With this espresso machine, you won’t have to worry about timing your own espresso shot or tamping the grounds perfectly. A quality automatic machine like this one does it all for you. An especially cool feature is the aroma setting, where you can control how much of that delicious espresso aroma wafts through your kitchen. Adjustable settings for espresso strength and grind: You can adjust the strength and size of your espresso with the settings on the sleek touchscreen control pad. Convenient cleaning: This home espresso machine is built in a way that makes it easy to clean. Energy efficient: It has an automatic switch-off time to save energy. Integrated grinder: The built-in grinder grinds coffee beans of your choice to the perfect consistency and then tamps them for you. All that’s required of you is to push a single button. Small and compact: This small espresso maker is only 9 x 12.7 x 17.5 inches. Touchscreen controls: The touch panel has three cup sizes you can specify and two aroma levels to choose from. Heavy: Even though this home espresso machine is small, it weighs a lot. Hefty price tag: This isn’t one of the best espresso machines for people who are looking for an inexpensive option. Only brews one cup at a time: This espresso machine is best for couples or singles. It’s only capable of brewing one cup at a time. But the upside to a one cup model is fresh espresso every single time. SMEG’s ’50s Retro Style Espresso Machine is a beautiful, compact machine that will look great sitting out on your kitchen countertop. This manual espresso machine is best for those who appreciate good craftsmanship and the art of brewing espresso. If you want the ability to control the timing, tamping, and grind size of the espresso on your own, this machine is an excellent choice. You can pull two different shots simultaneously from this chic espresso maker. Every espresso maker comes with a free one-year manufacturer’s warranty. Consider buying a longer warranty to keep this beautiful machine running well past a decade if you don’t want to do the espresso machine repairs yourself. Available in four different colors: You can choose from black, red, cream or pastel blue. Beautiful vintage, retro design: If you love vintage looks or want something more unique, this is the perfect espresso maker for you. Compact size: This machine should fit on most countertops. Steam wand for frothing milk: You can also steam or froth the perfect foam for cappuccinos and lattes with the attached steam wand. Uses both espresso grounds and paper pods: If you don’t have a preference or like to switch, you’re in luck. You can use both with this home espresso machine. No automatic capabilities: Unlike some of the others on our list of best espresso machines, you’ll have to do everything manually with this option. No touchscreen settings: Because of the retro look, you don’t have the benefit of high-tech touchscreens. On a budget? The Mr. Coffee Cafe Barista is a quality machine at an even better price. For less than $200, this simple but effective espresso machine will brew delicious espresso shots, lattes and cappuccinos with a one-touch control panel. It also includes an automatic steam wand so you can easily get perfect foam every time. You don’t need to be a professional barista or espresso expert to operate this espresso machine. The control settings couldn’t be easier to navigate. You can customize your drink preferences and brew strength just by pushing a few buttons on the side. Cleaning your espresso machine is also a breeze. Simply press the automatic clean function and it will backflush after every brew. 15 bar pressure pump: This pump helps extract the rich, bold flavors you’re looking for. Adjustable cup tray: This allows you to fit different mug sizes so you never have to worry about your mug being too big to use with the machine. Affordable: Out of all of our options for the best espresso machines, this is the easiest on the wallet. 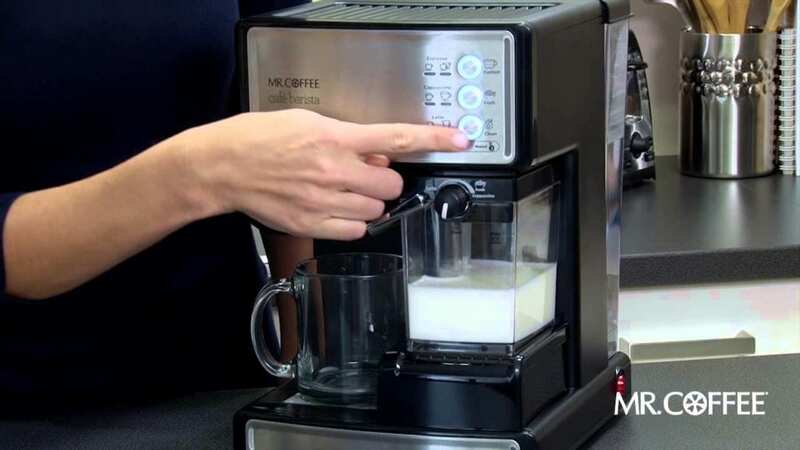 Automatic milk frother: This feature removes the guesswork. You just select the froth level and let the machine do the work. One-touch control panel: This makes it easy to select between single or double espresso shot, cappuccino or latte options. Removable milk pitcher and water reservoir: When you need to clean your home espresso machine, you can remove the pitchers and reservoir for easy cleanup. Not capable of brewing a full pot of coffee: This machine is best for someone who needs smaller amounts. No integrated grinder: You’ll have to grind the beans yourself. Small water reservoir: This home espresso machine doesn’t hold as much water as many other espresso makers do. An espresso machine is a versatile home appliance. It’s capable of a lot more than just pulling single or double espresso shots. The capabilities of espresso machines depend on the type of model you buy. If it includes a steam wand or automatic setting, you’ll also be able to enjoy americanos, cappuccinos, lattes, macchiatos, ristrettos and lungos. The versatility doesn’t end there, though. Here are five things you might not have known an espresso machine can do. Sure, you knew an espresso machine made espresso. That’s the whole point. But did you know that some espresso machines are capable of pulling the perfect espresso shot every single time without any effort on your part? Automatic espresso machines like the Jura Ina Micro 1 do everything for you. They grind the espresso beans to the perfect consistency. Deposit the perfect amount of coffee grounds into the filter and then tamp them just right for you. Worried about the pull time? No need to! Simply adjust the strength and size options on the touch screen control panel before brewing. Automatic machines will time your espresso shot to make sure it comes out just the way you like it. Many espresso machines come with a built-in steam wand attached to the side. This means you can steam and froth foam for your favorite espresso drinks like lattes and cappuccinos. You can even buy an espresso machine like the Mr. Coffee Cafe Barista that automatically steams and froths milk for you. With a home espresso machine that includes a steam wand, you can whip up your favorite specialty drinks easily at home. Drinks like lattes, cappuccinos, americanos, macchiatos, ristrettos and lungos are all convenient to make with an espresso maker. You can even add espresso shots to alcoholic mixed drinks, desserts and sweet iced drinks. Most espresso machines include a hot water spout, giving you the option of brewing hot tea. Using the hot water spout attached to your espresso machine can be faster and more convenient than waiting for a kettle of water to boil. You could even pour the steaming water over a cup of noodles. Now that’s convenient! Not all espresso machines are built the same. Some espresso machine models let you brew a 10-pot cup of coffee or a single espresso shot. If you don’t have a coffee machine or want to upgrade into an all-in-one machine, consider something like the Ninja Coffee Bar Glass Carafe System. There are a few different espresso machine models on the market. When you’re choosing from the best espresso machines to decide what you need, you’ll need to choose if you want your machine to be manual, automatic or super-automatic. Manual home espresso machines are sometimes also called semi-automatic. These options for espresso makers give you the most control over how long you pull your espresso shot and how fine you grind your beans. This is the best option for coffee aficionados or anyone who appreciates vintage products and craftsmanship. These models are usually programmable and pull the espresso shot for you. Some automatic models also give you the option of switching into manual mode. This option in espresso makers is best for anyone who wants to learn more about brewing espresso with the option of automatic convenience. The highest tech option of them all, most super-automatic espresso machines include options to brew cappuccinos and lattes with just the touch of the button. These espresso makers also often come with self-cleaning capabilities. This model is best for anyone who’s new to espresso brewing and wants to make their favorite espresso drinks with ease. How many people you’ll most often be making espresso for. 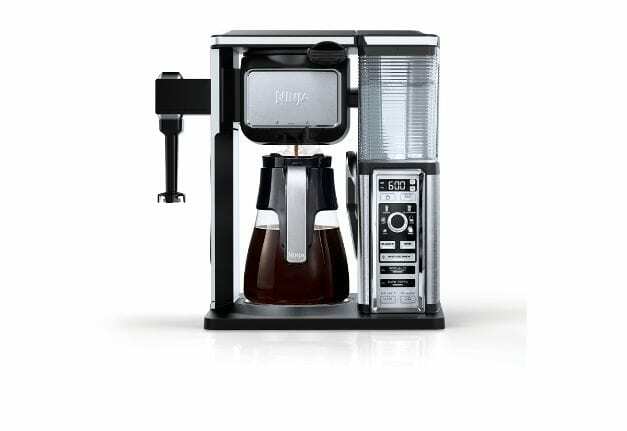 If you live alone and will only be brewing single-cup drinks, go with a simple model like the Jura Ena Micro 1. If you want a model that’s capable of brewing a 10-cup pot of regular coffee at the same time as pulling a double espresso shot, go with the Ninja Coffee Bar Glass Carafe System. On a budget? Consider the Mr. Coffee Cafe Barista Espresso Machine. Should You Buy a Home Espresso Machine? With quality coffee shops popping up on almost every street corner in America, you might be wondering if owning your own espresso maker is worth the cost, even if you get one of the best espresso machines available. A good espresso machine can be an expensive purchase. Some luxury machines can cost $6,000! Although it isn’t necessary to spend that much on an espresso machine, some of the models we reviewed are still a big investment. Dropping $500 or more an espresso machine might seem unnecessary. But the truth is, you’ll likely save yourself a ton of cash in the long run. Here’s why. If you’re considering buying a home espresso machine, you’re likely already spending a lot of money at your favorite coffee shop. 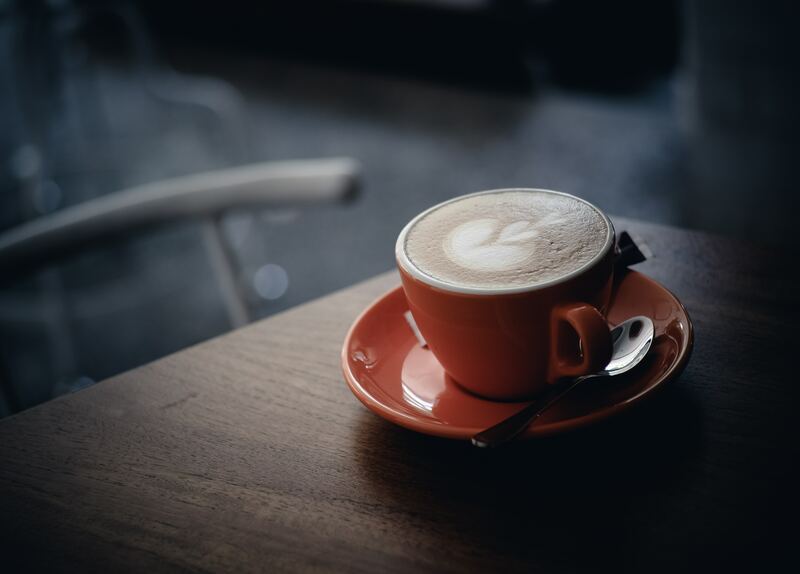 A daily (or sometimes even twice daily) cappuccino or latte habit can add up pretty quickly. A Consumerist report shows that the average American spends about $20 a week on their favorite coffee drinks. That’s over $1,000 a year just on coffee! Your espresso maker will quickly be worth the investment. If you’re already spending $3 a day on espresso drinks, you can probably afford a better espresso machine than you think. Even the more expensive models will pay for themselves in under a year. Besides saving you a lot of money, an espresso machine at home can save you a lot of time. No more factoring in extra time to stop and grab your morning brew on the way to work or class! With a home espresso machine, you can brew your favorite espresso drinks quickly and in the comfort of your home. 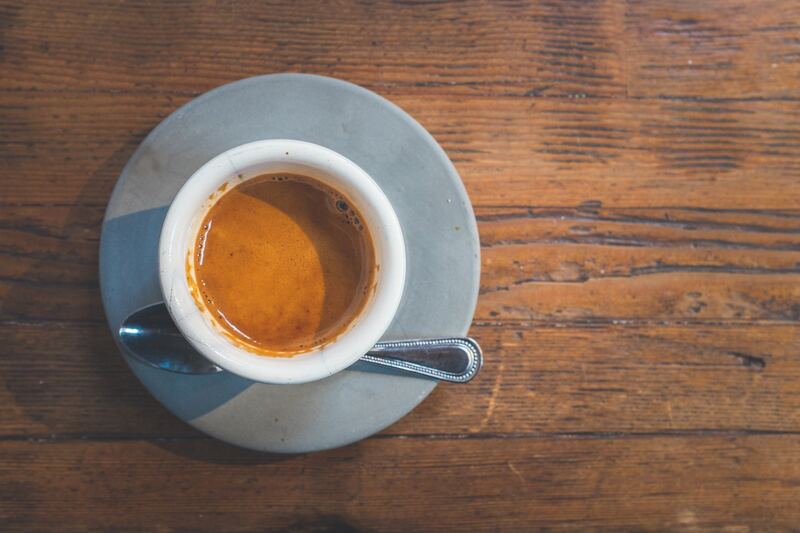 Some espresso makers require you to learn a little more about pulling quality espresso shots. You’ll develop a new hobby and even greater love for coffee in the process. Learning to perfect the grind size, tamping method, and pull time allows you to make espresso that’s custom to your preferences. Coffee beans have unique roast profiles with distinct scents and flavors of their own. Beans grown in the mountains of Peru have a different taste and strength than those grown in Ethiopia. Owning your own home espresso machine gives you the chance to learn the differences and which ones you prefer. You might even enjoy mixing different beans to create your own custom blends. You’ll also learn how the difference in adjustments can affect your brew. The grind size, tamping method, timing of the espresso shot and the amount of espresso grounds you add can all affect the espresso strength and flavor. You can quickly learn how to use an espresso machine. 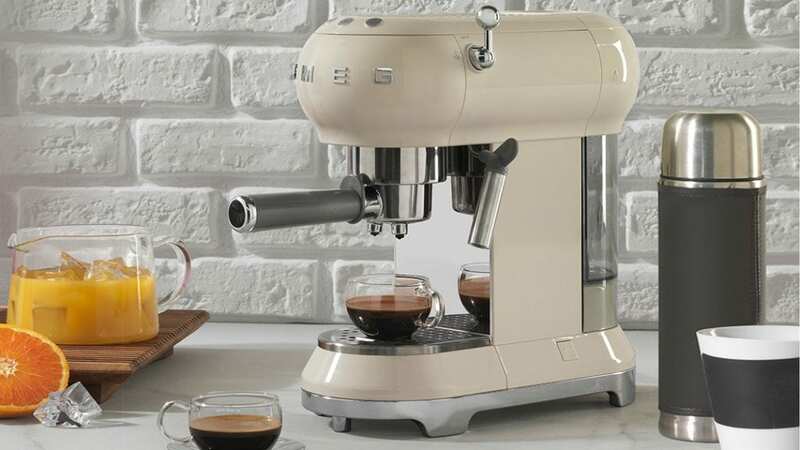 Espresso machines like the SMEG ’50s Retro and the Jura Ina Micro 1 espresso machine are designed to look stylish and chic in your home. You won’t worry about cluttering your kitchen with these appliances because they double as decoration. How do you know which espresso machine is best for you? Choosing an espresso machine that’s right for you means you’ll need to consider your coffee needs, your lifestyle and your budget. That fancy dual coffee and espresso machine might sound appealing, but if you drink a single shot of espresso every day, it’ll be a waste of space and money. A quality espresso machine should fit seamlessly into your lifestyle and last you a lifetime. Finally, after you’ve considered your needs and lifestyle, read as many home espresso machine reviews as you can find. Espresso machine reviews can help you further determine the best option for your needs, budget and lifestyle. 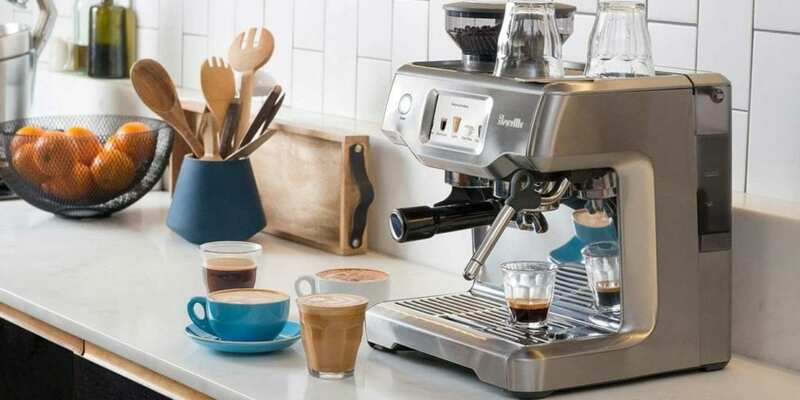 You can find espresso machines for sale online and in stores at several different retailers. 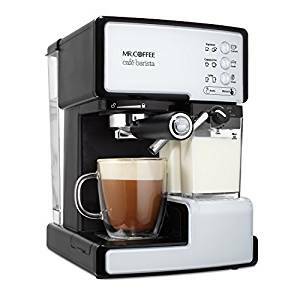 Amazon is one of the best places to buy a new espresso machine because they offer real customer espresso machine reviews and excellent warranty options. 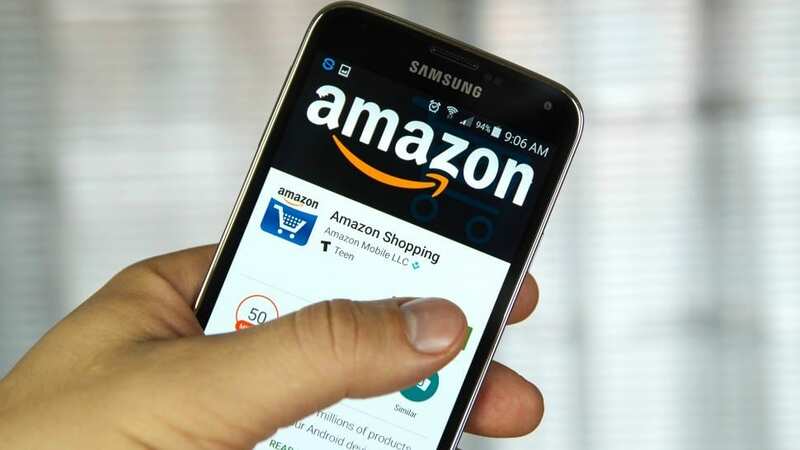 Products for sale on Amazon include detailed descriptions and product stats so you know exactly what you’re buying. Amazon even compares different espresso machine options around the same price point, side by side, to help you make the best decision. Espresso machine reviews on Amazon are real, detailed and honest. You can read what other customers are saying about an espresso machine you’re interested in. 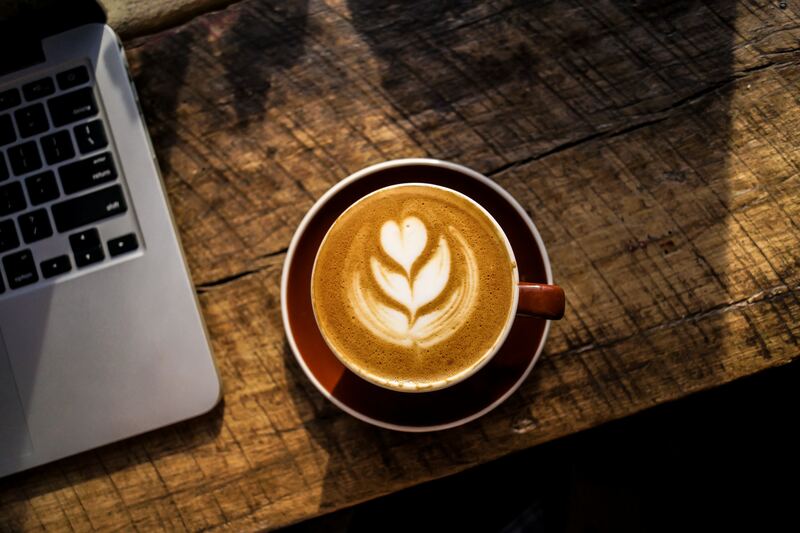 Reading real feedback in espresso machine reviews will help you avoid choosing an espresso machine that isn’t quite right for your skill level or lifestyle. Best Buy offers similar features to Amazon but doesn’t always beat Amazon when it comes to offering the best price. 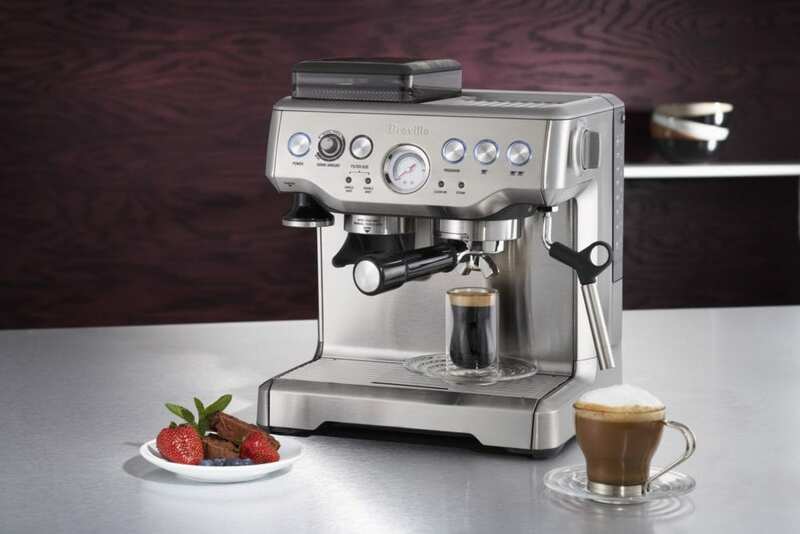 With Best Buy, you can read detailed espresso machine reviews and stats. You also have convenient side-by-side product comparisons and similar product suggestions. Other good retailers to buy a new espresso machine from are Abt Electronics Home Goods, and Walmart. Retailers both online and in physical locations often run special promotions to promote appliances at lower prices. While these deals can sound tempting, don’t choose an espresso machine based on the sale price. Sale pricing can often be misleading. Stores will sometimes lower the price of appliances that aren’t selling to try to unload them. Do your research before shopping around for espresso machines, and don’t let sales associates sway your decision. Go into the store already knowing what you want. You might not think you need a warranty for small home appliances under $500, but warranties can come in handy. 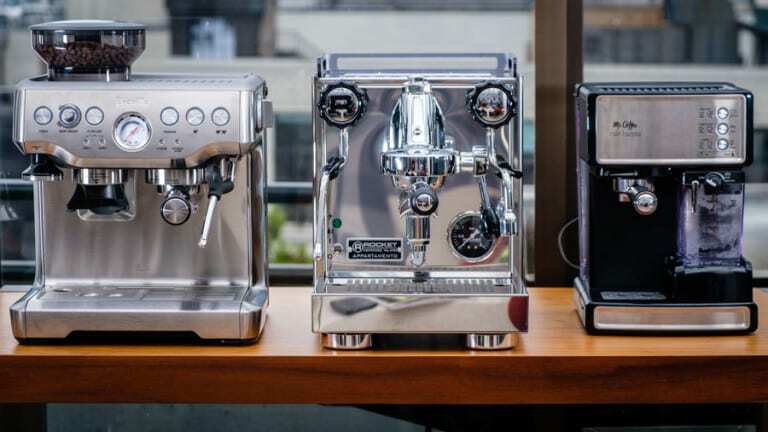 Some espresso machines come with a free one-year manufacturer’s warranty that covers the cost of parts and labor throughout the first year of purchase. To make sure your espresso machine lasts a lifetime, consider buying an extended warranty as well. A good warranty will save you time, money and a lot of headaches. Warranties are adjusted based on the price of the appliance you’re purchasing. You’ll likely spend under $100 for a quality three- to five-year warranty. Most espresso machine warranties are $30 to $50. When picking out a warranty, make sure it covers the cost of normal wear and tear, the cost of replacement parts and labor and includes electrical surge repairs. Electrical surges could make you replace your whole machine, so make sure this is covered. You also want a warranty that will replace a broken espresso machine that can’t be repaired with a brand new one or at offers a rebate for the original cost of purchase. We’ll go through a few major retailers and how their warranties work. Amazon offers a three-year standard warranty or a four-year small appliance protection plan. Walmart offers three-year and four-year warranty plans. Best Buy offers a two-year protection plan. If you pass on the warranty or go with a cheaper one that only covers the cost of replacement parts, you can handle espresso machine repairs yourself. Overall, we believe that the best espresso machines are worth the investment. If you’re looking for an espresso maker, read our detailed espresso machine reviews to learn more about which would be the best option for your needs.